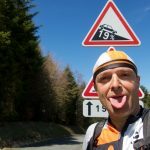 Stage 9 of the 2017 Tour de France will be the toughest Jura mountain stage ever. Easily. 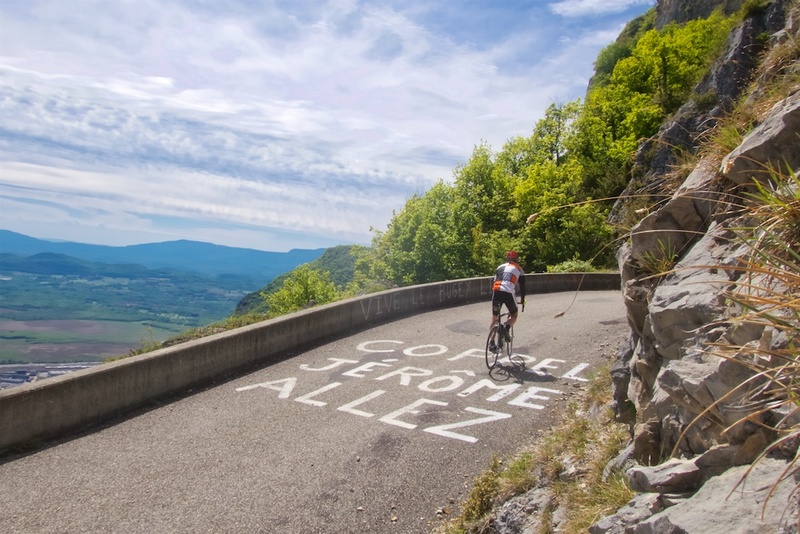 And along with Mont du Chat and Grand Colombier, it will introduce Col de la Biche to the lycra-clad masses. 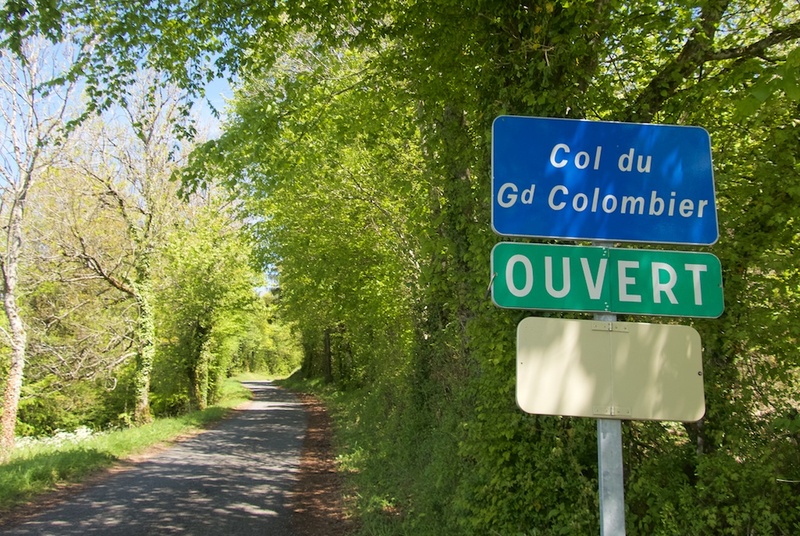 Today I rode the middle two climbs: Col de la Biche, and Grand Colombier as the Tour will climb them. This will be the first Tour appearance for Biche. 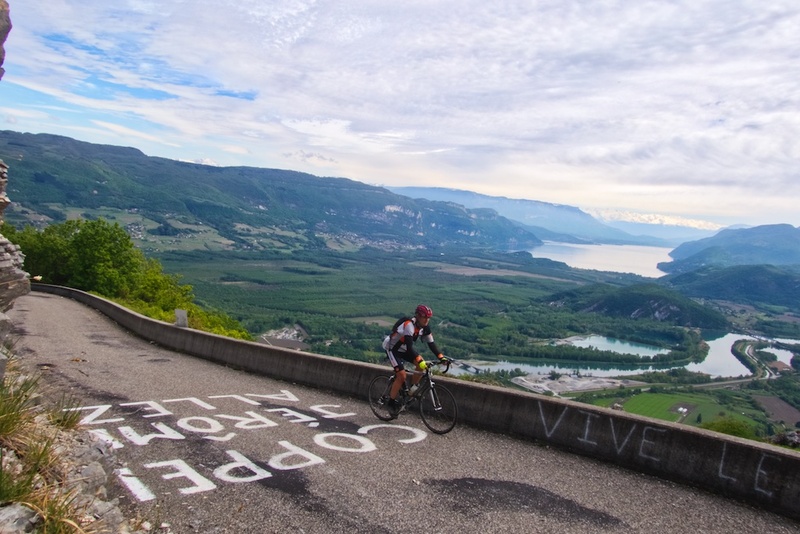 It’s the third for the Jura giant Grand Colombier, but the first time from the steepest side (all 4 sides are steep). 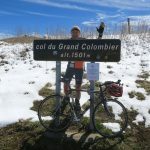 In February I cycled a beautiful if snowy loop that includes Mont du Chat, the final climb in the above stage – see here. 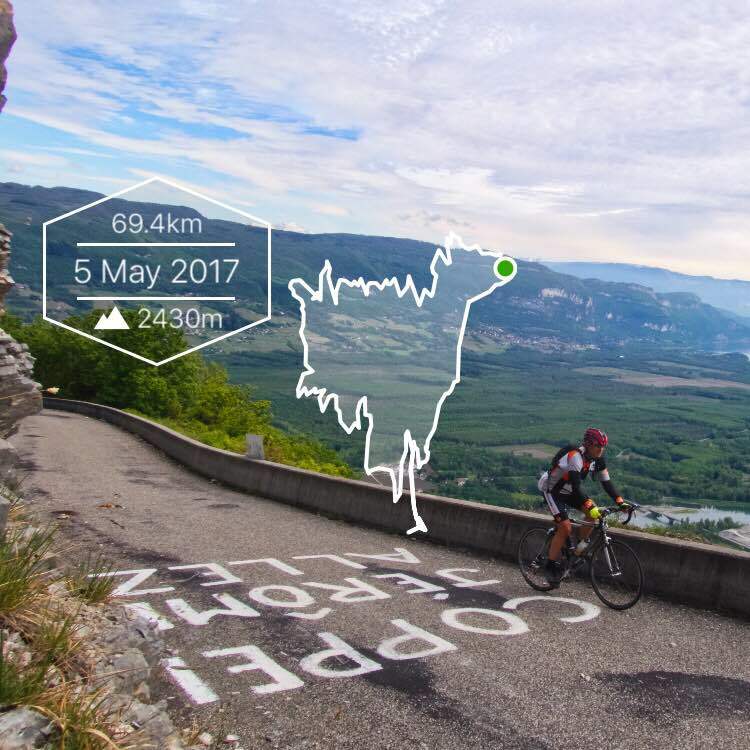 Mont du Chat and Grand Colombier will receive all sorts of pre-Tour coverage as monster climbs on, arguably, the best stage of the 2017 Tour (this or the Izoard stage). 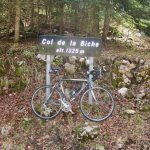 But, Col de la Biche is another very challenging road. 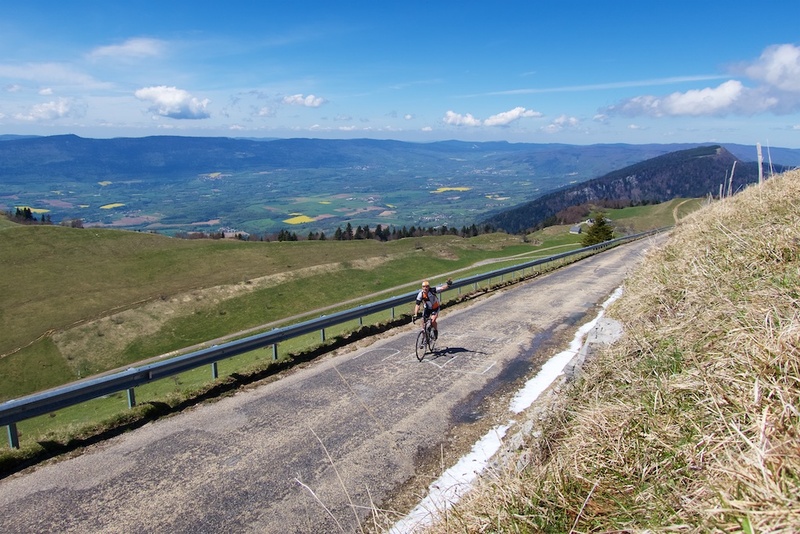 Most cycling sites/profiles will tell you it starts from Gignez, but Monsieur Prudhomme and I know that one can start two and a half kilometres lower on the banks of the Rhone river in Seyssel. Still, it’s at Gignez where things get steep. The profile shows how tough this climb is, but there are several respites, and thus several stretches far steeper than the average km grades – often touching 13% I’d say. Much of the climb is lined with young deciduous woods that block the views but provide little shade. 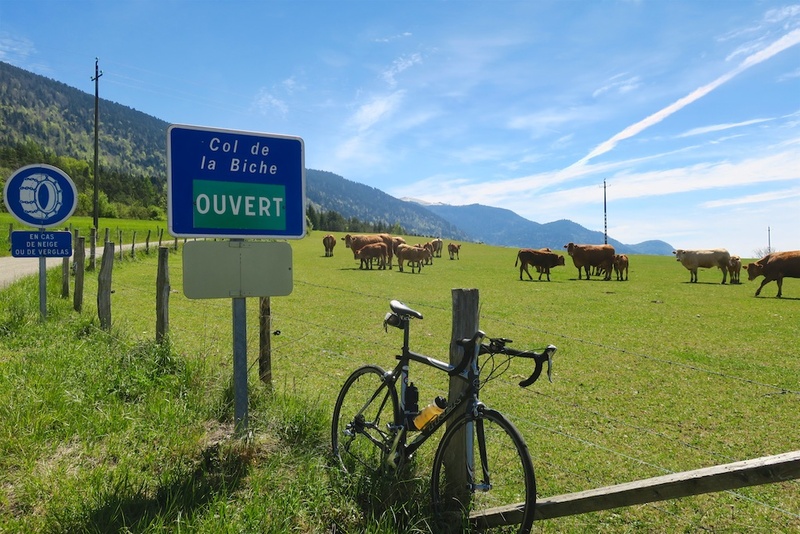 Biche is a short-cut to nowhere and there is little along the way – some cow pastures so it’s supremely quiet. You may see one car, you may not. Up higher, the views improve and the distant Alps are impressive. 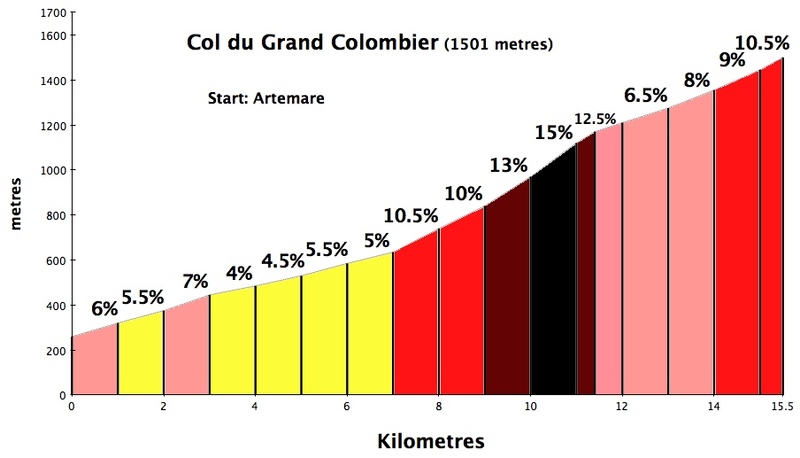 As the profile shows, the climb summits then does a short “down-up” to the Col itself. 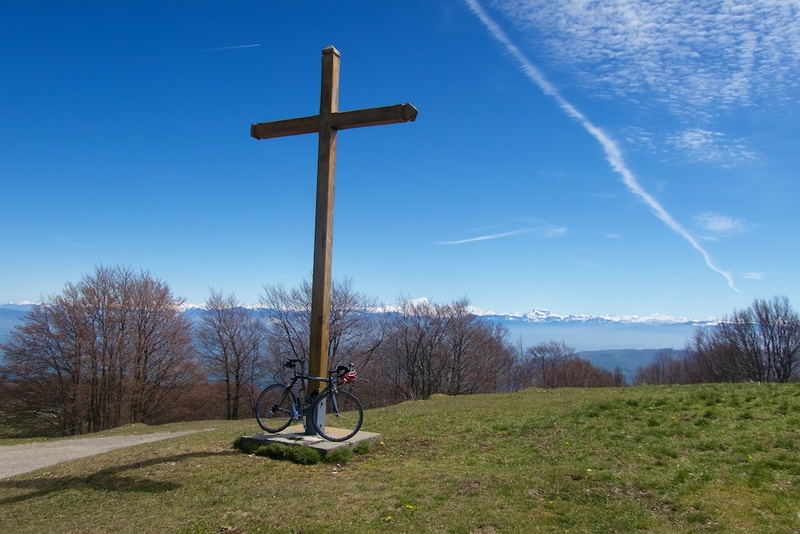 The first summit is at the Croix de Famban, a perfect spot to watch the Tour stage. Great views. 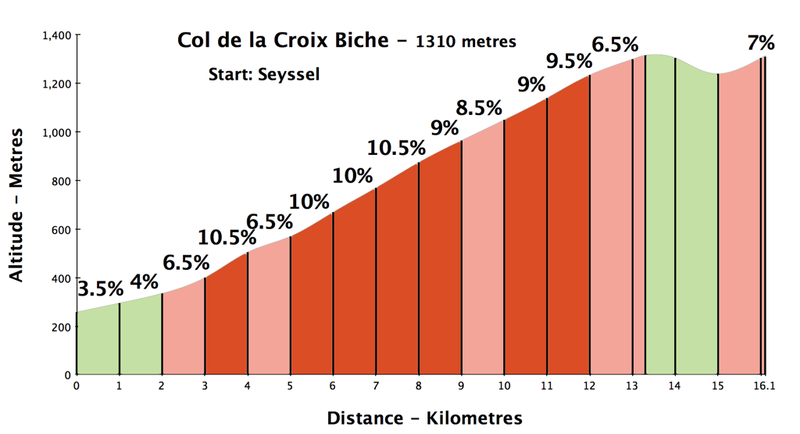 The proper name for Col de la Biche is Golet de la Biche. Golet is an old local word often used for col/pass in the French Juras. 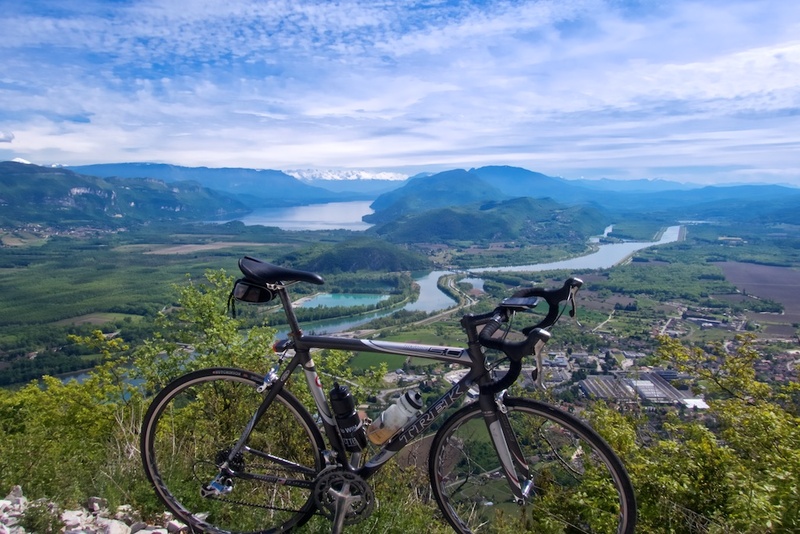 See here for details of all 4 sides of Grand Colombier. 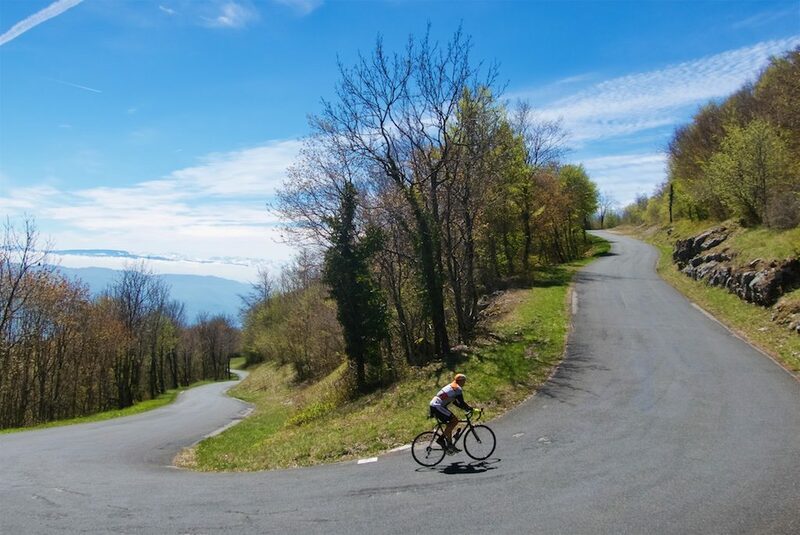 The first time I heard about the ultra steep variant up Grand Colombier, my friend told me: “but don’t descend it, it’s too dangerous.” Ha, sound advice. Coming from Biche the Tour (and I) skipped the lower easy 7 kilometres of the climb (which starts in Artemare). I, as the Tour will, turned up at Virieu-le-Petit. And I do mean up. This early steep stretch is basically a short cut of the route that the Tour climbed last year. The last 5 kilometres share the same route. The steep short cut is on a tiny road. It’s a surreal experience to be cycling for a couple of kms at 12% then see the road ahead get noticeably steeper. The road maxes out at 22% and for perhaps several hundred metres it pushes 20%. My goal was just to not put foot to ground. I succeeded, often approaching speeds as high as 5 km/ph. Ouch. There is a brief respite, but the last 2.5 kms get steep again. A few metres below the summit would be a great spot to watch the Tour as one can see the last couple of kilometres below. 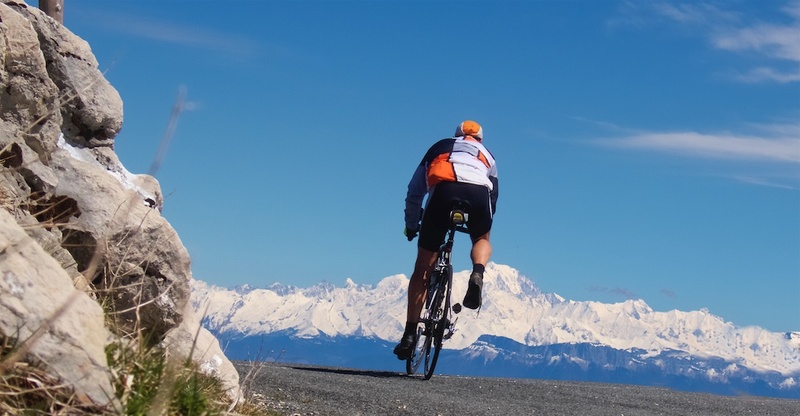 On a clear day, just metres from the col, the view of Mont Blanc – FAR away – is fabulous. Unclipping, almost as though the photo was staged. UPDATE: June 26th, the Coluz side has been re-opened. Great news. The plan was to descend – as the Tour will – to Anglefort. But along the way, I wanted to have a look at the Culoz side. Making its Tour debut in 2012, the Culoz side is by far the most scenic of the four sides. Branded as Les Lacets (hairpins) du Grand Colombier, these hairpins jutting out the south side of the massif offer terrific views of the Alps, Lac du Bourget, the Rhône river, etc. 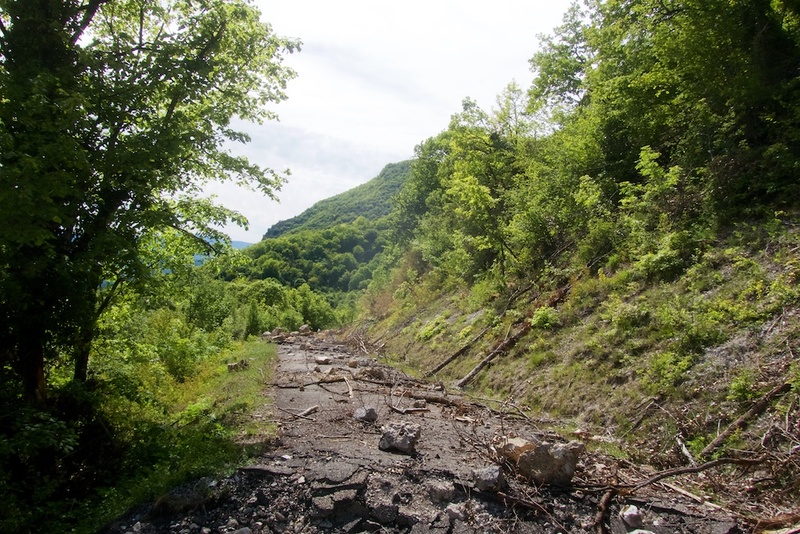 But this March, below the hairpins, there was a major landslide. The road is expected to be closed until at least 2018. I snuck around the road closure sign where the route joins the Anglefort side and descended to Les Lacets. It was a touch rocky as it hadn’t been cleaned but it is still stunning. Lower down I ran into the edge of the landslide. Apparently, huge boulders ran up alongside houses. And it’s far more than just fixing and clearing the road. The authorities will want to ensure the cliffs above have been made safer – not easy. Luckily the wonderful hairpins just above are fine. The local authorities sponsor car-free days on the 1st Saturday (Jun-Sept) of every month – usually up this side. This year they will ride the Artemare side instead, due to the landslide. Well done for not canceling this event. Details here. Finally, I descended back to Seysell. The last couple of kilometres being the only time I saw any real traffic – nothing much though. Nice writeup, Will. I am really looking forward to this Tour stage, having done all of the climbs at various points, just not on the same day! 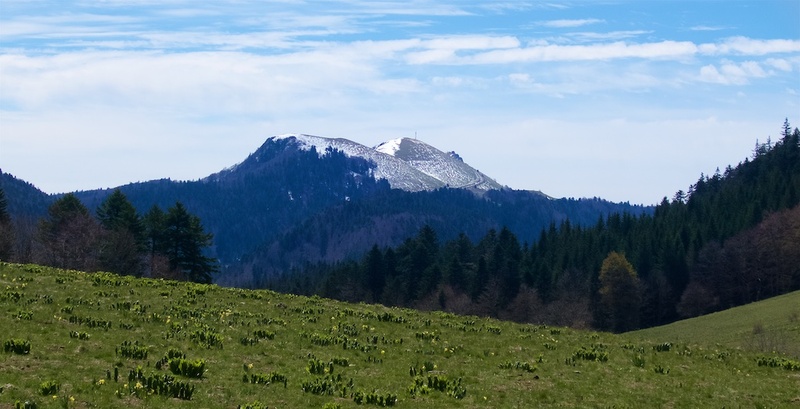 The Croix Biche from Seyssel is a nice climb, although I thought about turning around halfway due to a wild boar by the side of the road — it really doesn’t see much traffic, as you said. In the event, the boar moved off and I continued upward. The Artemare side of the Gd. Colombier is truly evil. When you get to the last km at 10.5% or so it almost feels easy. 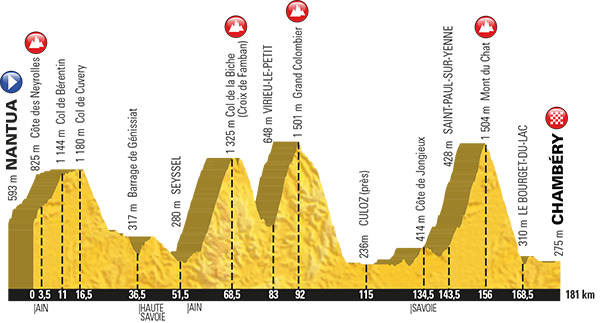 The idea that the riders will do these two (plus Berentin at the start) and THEN the Mont du Chat boggles the mind. Small quibble: what you have on the Culoz side is a landslide, not an avalanche. Michael, thanks. Got it: éboulement = landslide. Changed in post. Great ride Will. I don’t think the Izoard stage is going to be a patch on this stage! Nice write up indeed Will! Reminds me that I should try other regions than the high Alps too. Curious how the pros will handle this terrible stage! Thanks for the great info for this ride that me and Flo did today. Starting in the rain the climb to Biche from Seyssel was truly excellent and so quiet……..then the epic climb up Grand Colombier via Virieu le Petit………our front wheels kept lifting on the 20% plus section………a sort of mental battle to stay on (actually we were hanging on for grim death) but only just with speeds on that section reaching 4 – 5 kph. We were wishing we had our mountain bikes. After that we began to enjoy ourselves! Lucky you! Apart from the showers around 08.30 we managed to avoid the rain fortunately. That was our first visit to an area that is only 90mins from home. Very impressed and thanks again for such an informative site. 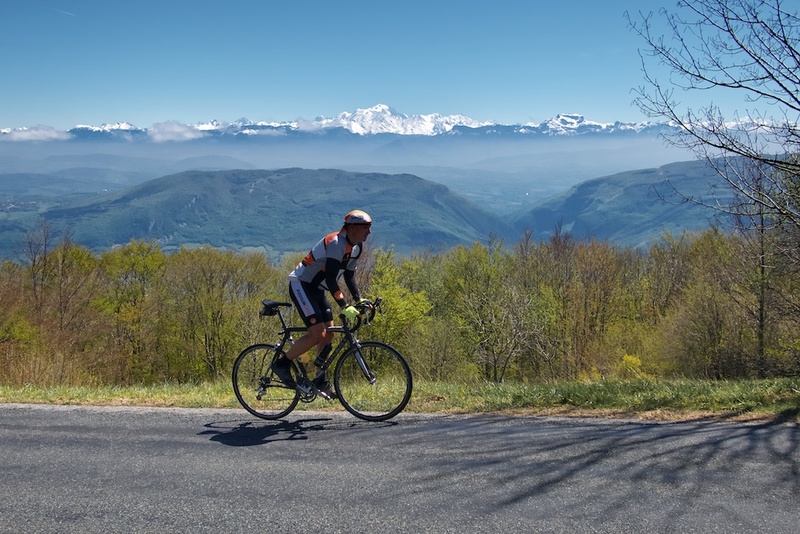 Thanks Will for an excellent route even if I did cheat and climb from Lochieu as the Tour de l’Ain will on Saturday. 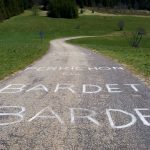 My plan was to do the “lacets” on Saturday when the stage finishes in Culoz but there was a “route barree” (road closed) sign where they join the Anglefort road, so I guess that plan will have to wait. Wimps note that you can take a selfie of the 19% sign without the trauma of actually trying to ride that stretch of road. According to tourist information the ascent from Culoz (the lacets) is still closed. Could I ask you where you heard this? I called tourist information in Bugey Grand Colombier because I wanted to go up that way to watch the race. In the end my son abandoned after a crash so I never made my second assault. I had seen the web sites too but obviously wanted to be at the top at the right time. 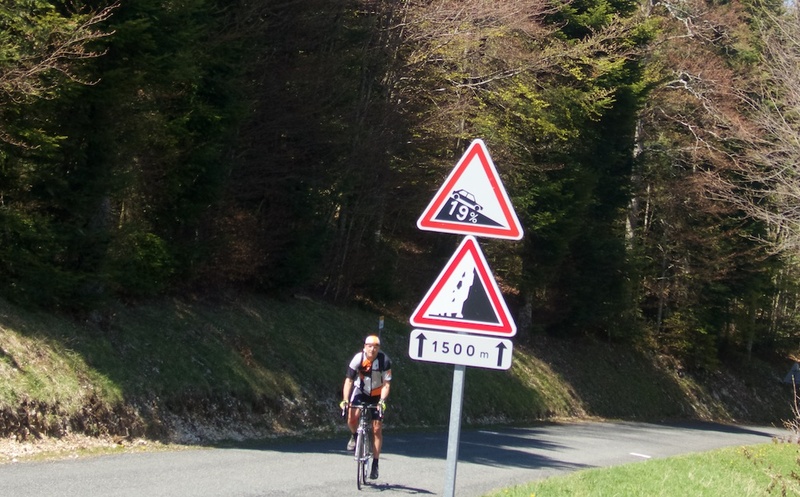 It may be that they wanted everyone to be climbing the same way as the race (from Lochieu). 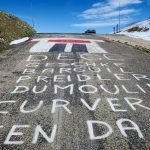 There were signs saying that the Col de la Biche was closed for the race on Saturday even though the race wasn’t going that way. I would call the tourist office in Culoz and ask in case they were only closing the road for the race.